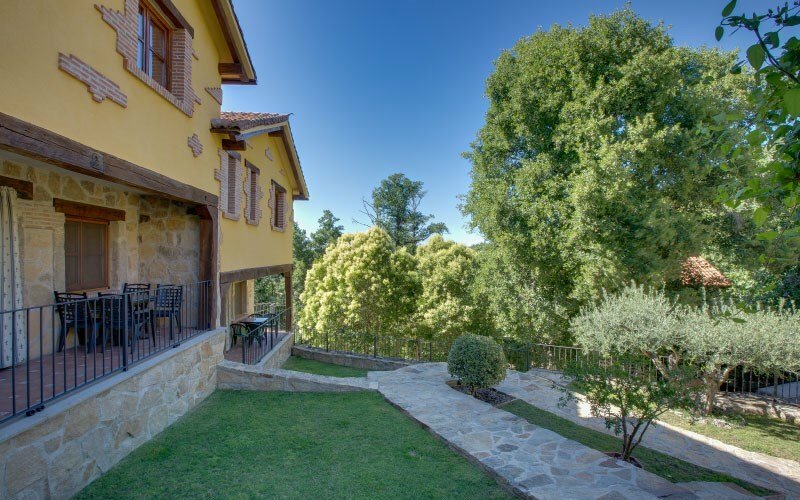 In the small town of Casas del Monte in the province of Caceres (Extremadura, Spain), famous for its exquisite strawberries and cherries, are located Gîtes Acebuche in a place of extraordinary natural simplicity, a half-foot of the mountains traslasierra ( to 750m. attitude) in the north of Extremadura, specifically in the area called "Swiss Extremadura." Along with the wide Throat, the murmur uninterrupted water on the rocks to entrechocar causes the traveler evocations dreamer who may commence with a visit to the Roman archaeological sites along the Via de la Plata. With traditional crossing paths throughout the term for calm ahead in hiking or cycling. And if you attract higher emotions, accounts with clues to the practice of parachuting in the top of the mountain at about 1490 metres. Undoubtedly it is a dream destination for rural tourism. With beautiful sunsets around the spot where Ambroz Valley vislumbrando lontananza in the small town of Granadilla (walled village flooded by the reservoir and Gabriel Galan, now become school workshop) jurdanas antechamber of the land. Following the ancient path of silver and after crossing the arc Roman Cáparra, heading south, we visit the majestic medieval city of Plasencia, nerve centre of the whole area, which opens the door to two valleys, Valley of the cherry par excellence, the Jerte Valley and the Imperial district of La Vera, and of course, the jewel of the Mediterranean vegetation and wildlife that is the park where Monfragüe enjoy everlasting flight of eagles and vultures. On the other side, Hervas, with one of the most important Jewish neighborhoods throughout Spain and a little further north on land-Spanish leonesas, textiles Bejar alongside Candelario which has a popular architecture perfectly preserved, under the ski resort of La Covatilla, where you can enjoy winter sports, all of this just thirty minutes by highway from the Route de la Plata.